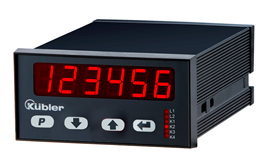 The new 574 Dual Frequency Display, from Kübler, offers two individually scalable encoder inputs, in each case A, /A, B, /B for count frequencies up to 1 MHz per channel (also for single channel use). In addition, 4 freely programmable, fast solid-state outputs, each with 350 mA output current, are provided. The many different output modes offer further flexibility, which is reflected in the simple programming using four keys and in the programmable dual functions. For this there are function codes that are dependent on the operating mode selected. In total, 9 fixed, different frequency functions, for example, single, dual, difference and total value measurement of both inputs, product and ratio measurement, percentage measurement, in-process time calculated from frequency (reciprocal speed). Furthermore, the device also offers up to 3 display values: Display Frequency 1, Display Frequency 2 as well as the calculated value from 1 and 2. The AC and DC supply voltages are integrated in one device and the 574 Dual Frequency Display can be used either as a frequency display or as a tachometer with limit values. The display itself boasts a bright, 6-digit LED display (15 mm), which guarantees excellent readability. The monitoring functions, where 2 values can be monitored or calculated with respect to each other, the 4 fast, programmable inputs with various functions such as start delay, key lockout, display memory, reference input or switching between displays also feature in the unit’s repertoire. The device’s many features are rounded off by the RS232 interface, fitted as standard, that can be used for parameter setting, for reading out the values or for modifications during operation, and by the scalable analogue output 0/4 … 20 mA, +/-10 V or 0 … 10 V.